The Moon enters Taurus at 6:09 AM EDT. We’re in the balsamic phase now as we move towards tomorrow eclipse. Balsamic energy, as a waning energy, tends to be about releasing or letting go, resting, staying out of the fray, holding back, and reviewing the past. With the Sun, Moon, Mercury, Venus, Mars and asteroid Pallas all in Taurus, fixed earth energy is very strong and there can be a tendency to be stubborn, plus a resistance to change, so it’s somewhat at odds with the balsamic energy’s urger towards dissemination and release. This is reinforced by the Venus/Pluto aspect at 1:07 AM EDT, which also brings in one of the themes of tomorrow’s eclipse. Venus is in Taurus, aspecting Pluto the Destroyer/Transformer in Capricorn, so the modes of expression (choose one or more!) are as follows: we’re attracted to something we intensely desire, we want something dangerous or forbidden, we need to release our attachments to things we intensely desire, we want to destroy that which we desire, we’re hanging on too tight to relationships that need to be ended or transformed, we’re seeking a new path in relationships, we’re finding all our relationships seem fated, karma-filled, or pull us out of our normal orbits, relationships are at odds with business or financial interests, we suffer financial loss or gain and must make adjustments, we change our ideas about what we value or desire, power struggles or turf wars erupt over issues related to sexuality, sharing resources, money, real estate, death/wills/inheritances/probate or investments. There may be a great deal of initial resistance, but the forces of change are inexorably rolling our way, so adjustments will inevitably need to be made, and we’re not going to be all that comfortable with it! The Mercury/Mars parallel at 12:47 PM EDT, followed by a Moon/Jupiter aspect at 2:11 PM EDT, mean we’re gung-ho about some idea or plan that we’re very emotionally attached to and will try to get everyone else heated up about it too. Given that the next aspect is the Moon sextile Neptune at 4:10 PM EDT, you might find some people willing to leap onto your bandwagon in the afternoon (especially if you lower your voice and appeal to their charitable side). By evening, the Moon opposite Saturn radiates “ix-nay”/ no way” energy and a distinct lack of sympathy –nobody’s feeling like reaching into their pockets to support something untested. Don’t be too hard on yourself—the period right before an eclipse tends to be volatile and people can be moody, depressed or strangely intense. I’m going to look at our two Symbols in combination today. There’s a dude in a red outfit shooting arrows at the Moon, and a new continent that’s just come into being. One activity has produced something, the other is rather quixotic. 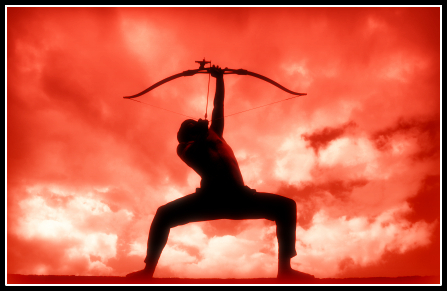 The Kozminsky Symbol, a red-clad archer (red relates to fire, and Sagittarius, the Archer, is a fire sign) is very “fired up” (red) emotionally (shooting at the Moon), but the arrows are going to fall short. He wants what he wants when he wants it, even if it’s impractical or foolish. The Keyword is “futility”, so nothing much will come of his efforts right now. The key point here is a willingness to try, even if you look foolish. Maybe this experience will show him what can and cannot be done and he’ll look for better targets next time. At least he’s aiming high, and trying to reach the soul of the matter. With more experience, he may be able to channel this restless energy in a different direction. The Sabian Symbol allows us to witness the birth pangs of a new world. This image reminds me of what happens during major earth changes. Some areas disappear, others are born as plates collide and volcanoes erupt. Extreme change can occur in an instant, but the processes that initiated it have been operating for some time. With the current Uranus/Pluto square, we’re in the thick of this process and the planet is morphing into new forms. This symbol reminds us we need to be able to adapt to change–since there’s no way to avoid it. Hiding or resisting is not a strategy. We’re entering a whole new world, totally unexplored territory. This is an illustration of the concept of cycles as related to the creative process of birth, death and renewal. We must adjust to this new territory. Strategy is required n order to help us figure out how we fit into this strnage new world. The down side is stubbornness, an inability to learn from experience, and the uneasy feeling of always being in flux or a state of restlessness brought on by non-stop change. On the mundane level, today’s the kind of day when we may notice that something that seems pointless or foolish (the Kozminsky Symbol) is actually a marker or herald for an “earth-shattering” advance. Someone playing around in a lab with leftover material discovers the cure for cancer. Accidental discoveries and spontaneous reactions make the new. We are suddenly made aware of something startling. It’s been taking shape for some time but now is its time to rise, like an island popping out of the ocean in the wake of earthquake or volcanic activity. OK, so it’s Spring (Page of Pentacles) and the seeds you’ve planted are coming up now. Everything’s in a state of flux, reaching for the warmth of the sun’s rays. There’s an openness, a willingness to learn. We’re at the beginning of the cycle and have made a good start, but must learn to be patient. After this promising start, we get blocked, caught in the middle, don’t want to see/don’t want to hear. The initial energy flow is diverted and paralysis sets in. Maybe we’re in the middle of someone else’s fight, maybe we’re afraid to move to the next step and just got stuck, maybe we’re comfortable with the way things have been and don’t like the idea of change. We’re detached from our environment because of the way we think about things. When we started out we were organically connected to the new growth and development (like the new continent in the Sabian Symbol), but then we get stuck because we’re being influenced by outside forces and are reacting rather than initiating. Whether it’s a sword or a bow and arrow (the Kozminsky Symbol), the incorrect deployment of any kind of energy, whether mental, physical, emotional or spiritual, will create some sort of blockage (hello, 2 of Swords). It’s time to explore new territory rather than remain stuck in fear or backdated habit patterns. Figure out what you’ve cut yourself off from and why you’ve stopped listening to your inner voice. As noted in the astrology section above, this eclipse season is presenting us with some scenarios that involve divorcing ourselves from familiar situations, and most of these will involve some sort of conflict/resistance scenario. Look and listen carefully to what’s happening in your world; avoiding things will not make them go away.